Don't miss your opportunity to learn from innovative leaders in communications. The Westin St. Francis on Union Square in San Francisco will host ComNet18 from Wednesday, October 10 to Friday, October 12, 2018. Reserve your room today at the discounted rate of $325 per night. Be a part of the on site action. Conference registration does NOT include accommodations and does NOT guarantee you a room at the St. Francis, so please book a room early to ensure your best chance of securing a space in the hotel. The cutoff date to book your room is Tuesday, September 18, 2018. NOTE: The Communications Network does NOT work with third party vendors to book accommodations. Please ignore anyone who contacts you about your hotel reservation who does not work directly with The Westin St. Francis. In 1902, after studying all of Europe’s grand hotels – from those in Berlin, Vienna and Monaco to Claridge’s in London and The Ritz in Paris – construction on the original St. Francis began. On March 21, 1904 – two years and $2.5 million later – the doors of The St. Francis opened. By seven o’clock that evening, a line of carriages and automobiles stretching three blocks waited to approach her brightly lit towers. The hotel became so popular that within six months the owners announced plans to add a third wing, two floors of apartments and a ballroom. At 5:04 on the morning of April 18, 1906, the people of San Francisco were awakened by an earthquake. Gas lamps tipped, stoves toppled, electric wires broke, gas mains cracked, and water lines burst. Many buildings in the city of San Francisco were destroyed by the fires that erupted because of the earthquake. Following the earthquake, a tent city was set up in Golden Gate Park for people who had lost their homes and in the days that followed citizens banded together to clean up and rebuild their city. During this time, the wine steward’s small fox terrier was found in the basement, hiding among the exploded bottles of wine of the fire-damaged St. Francis Hotel. The dog became a celebrity, his picture even appeared in the newspaper, and he was named Francis and became the symbol of the miraculous survival of the hotel. After the Great Earthquake of 1906, the square was dubbed “Little St. Francis” because of the temporary shelter erected for residents of The St. Francis. Documented records of the opening were lost in the fire that destroyed the interior of the hotel’s original 250 rooms following the earthquake. 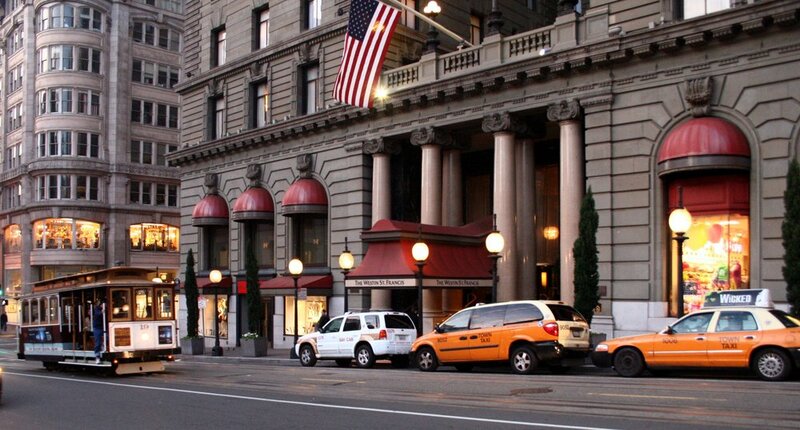 Within 40 days of the inferno, a temporary hotel of 110 rooms was erected in a court around the Dewey Monument in Union Square, and The St. Francis continued as a focal point of downtown San Francisco. The hotel refurbished its interior and re-opened with 450 guest rooms late in 1907. A third wing opened in 1908, and further additions followed on Post Street – making The St. Francis the largest hotel on the Pacific Coast. Construction of the 32-story Pacific Tower began early in 1969, adding a vast new complex of guest rooms, suites, venues and banquet facilities that opened in 1971.